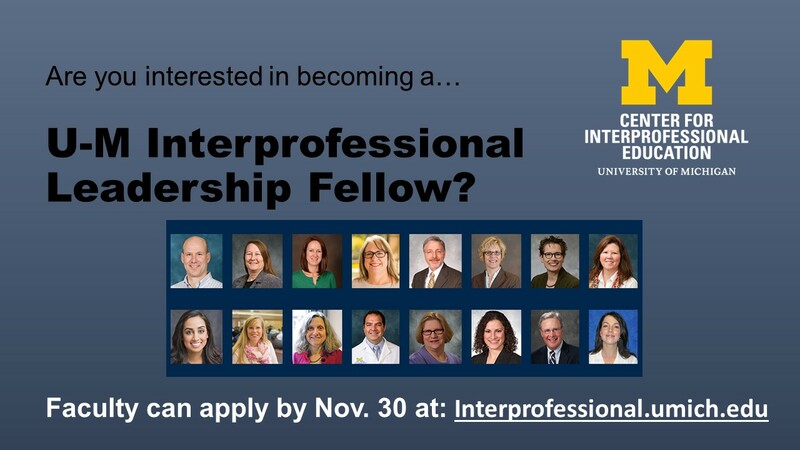 If you are interested in becoming a U-M Interprofessional Leadership Fellow, fill out the quick and easy application by Wednesday, Nov. 30. The program is designed to provide U-M health sciences faculty members with opportunities to develop their interprofessional education and leadership skills, working with academic and practice leaders at the university and national level. Participate in a fully-funded 3.5-day national faculty development training program (including airfare, registration and travel expenses). Access and develop a support network that will provide coaching and resources for educational project design and scholarship development. Develop the expertise to serve as an institutional change agent for advancing interprofessional education and collaborative practice in the health sciences. Develop and implement an interprofessional education or practice project relevant to their respective unit, in collaboration with a multidisciplinary team of fellows. Apply for up to $5,000 per team of seed funding to support projects and scholarship. For more information, visit the Interprofessional Education website.